BOSTON — “Free, free Palestine!” protesters shouted, carrying a 30-foot-long Palestinian flag through the streets. 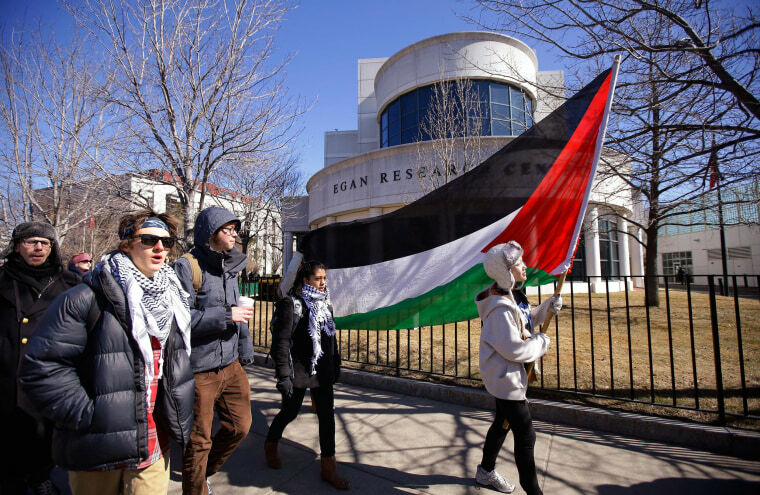 At first glance, the 150 people gathered just outside Northeastern University on March 18 seemed to be staging a typical rally criticizing Israeli policies—an increasingly common sight on left-leaning American campuses. But upon closer inspection, the mix of NEU students and local Boston activists were calling for another thing to be freed: their speech. Eleven days before the protest, the NEU chapter of Students for Justice in Palestine had been suspended, meaning they could no longer meet as a group on NEU property or receive university funds. The administration cited several violations of campus policies and procedures, most recently when SJP failed to get university approval to distribute 600 fliers on February 23. The requirement to obtain pre-approval before distributing fliers is in the student resource handbook at Northeastern. But according to SJP members, the university doesn’t consistently enforce the policy. “There are hundreds of fliers in different places around campus, and almost none of them have the university’s stamp of approval,” said Max Geller, an SJP leader. Charlie Flewelling, a third-year law student who's part of several Northeastern student groups, including the National Lawyers Guild and Queers United in Radical Rethinking, agreed with that assessment. "It is common practice for student groups to put up fliers around school," he said. "None of [our] fliers had university approval," but neither he nor any of his group members "have received any form of discipline or warning." Renata Nyul, director of communications at Northeastern, said SJP was "sanctioned based on a series of violations of university policy. Every student organization is viewed the same way. [SJP] is not being singled out." Northeastern also wrote in an earlier statement that “the issue at hand is not one of free speech." Still, the campus has become the latest battleground for pro-Palestinian student activists who claim they have been marginalized or unfairly punished by university higher-ups. Earlier this month, a banner reading “Stand for Justice, Stand for Palestine” was taken down at Barnard College following complaints by pro-Israel student groups. Last year, five Florida Atlantic University students were put on indefinite probation and ordered to take a civility training course after briefly protesting and walking out of a talk by a member of the Israel Defense Forces. Palestine Solidarity Legal Support, which has been tracking this issue, has documented more than 80 complaints of campus intimidation against advocates for Palestinian human rights. The Israel-Palestine conflict is a perennial campus issue, but the debate has particularly intensified in academia in the past few years. The American Studies Association announced in December that it would boycott collaborations with Israeli academic institutions and scholars who directly represent them, sparking heated debate on both sides (and counter-boycotts of the ASA). Criticism of Israel has become more mainstream in the United States since 2005, when the boycott, divestment and sanctions movement (BDS) began—including among Jewish young people. An October 2013 Pew Research Center survey found that 74 percent of 18-to-30-year-old American Jews now doubt that Israel’s leaders are sincerely interested in making peace with Palestinians. Pro-Israel groups like Hillel, the Zionist Organization of America, and the Anti-Defamation League have accused BDS groups of harassment at best and anti-Semitism at worst. In 2012, a Boston-based group, Americans for Peace and Tolerance, released a series of videos characterizing Northeastern University as having “a general anti-Semitic climate” and as a haven for Islamist extremism. But universities don’t usually take a position on Israel or Palestine in the wake of these incidents. Instead, they often slap student groups with conduct violations. “I don’t believe these universities think [SJP’s activity] is harassment or racism,” said LaHood. “Or else they would say so. I think they’re looking for a way to stop them in order to alleviate pressure” from pro-Israel groups and donors. Tuesday’s protesters, who delivered almost 6,000 petition signatures to Northeastern University President Joseph Aoun demanding that SJP be re-instated, were politically and ethnically diverse. Many were Jewish; Rabbi Joseph Berman, who wore a yarmulke, shouted through a megaphone that “standing up for the human rights of all people is not anti-Semitic.” The group was made up of both ardent pro-Palestinian activists and apolitical marchers who cared more about the First Amendment than the Middle East. Benedict was referring to one donor in particular: Robert J. Shillman, who has given millions of dollars to Northeastern, his alma mater, according to data compiled by the Indiana University Lilly Family School of Philanthropy and a Northeastern press release, and has sat on its Board of Trustees. He is also a public supporter of the Zionist Organization of America, which wrote a letter to Northeastern’s president in July 2013 expressing concern about SJP and anti-Semitism (Shillman was copied on the letter). Porell and other SJP members suspect he and other pro-Israel university donors have factored into the administration’s decision to suppress anti-Israel sentiment. Shillman's office did not respond to requests for comment. To many, the eviction notice incident is simply the nail in the coffin for SJP’s relationship with the university, which has been souring since 2012. The group was put on probation when they staged a walkout in the beginning of an event with an Israel Defense Forces soldier during Holocaust Remembrance Day. (The event was not part of the university’s official programming.) Offended by the “conflation of the Israeli armed forces with the memory of the Holocaust,” Geller and several other students walked out in protest. The group was charged with failure to secure a permit for a walkout. Pro-Israel student groups, like Hillel and Huskies for Israel, have long denounced SJP’s actions on campus as harassing and intimidating. Tuesday’s protest coincided with the hearing of two female undergrads, both members of SJP, who were sanctioned for “endangering” fellow students when they allowed the eviction-notice distributors into their dorms. Critics of SJP chapters across the country have echoed Stark, claiming there’s a thin line between anti-Semitism and free speech. But Sarah Wunsch, a staff attorney at the Massachusetts ACLU, said whenever the Department of Education has investigated formal complaints of Title VI violations—discrimination on the basis of race, color, or national origin—related to Israel and Palestine in the past few years, they’ve come up empty-handed. “In every case, [the department] has determined they do not constitute civil rights violations,” said Wunsch, citing recent unsuccessful complaints lodged at three University of California schools. The City University of New York and Rutgers University also launched internal investigations and found no violations, according to LaHood. What it really comes down to, said Wunsch, is whether people feel annoyed, upset, or offended.